In a previous post we talked six different types of siding products available at Wholesale Siding Depot, along with their individual attributes and benefits. Today we wanted to highlight insulated siding – specifically, Hybrid Insulated Monogram Siding and CedarBoards Insulated Siding, both from CertainTeed. Increased R-Value that can result in lower energy bills. Underlying foam insulating layer improves impact resistance of outer material. Foam underlayer can also provide better noise control by absorbing outside noise. Permeable construction allows water vapor to vent, preventing mold and mildew. Manufactured with non-toxic insect repelling treatment that wards off a multitude of pests, including termites. Tight-fitting seams create a clean look while preventing air infiltration. 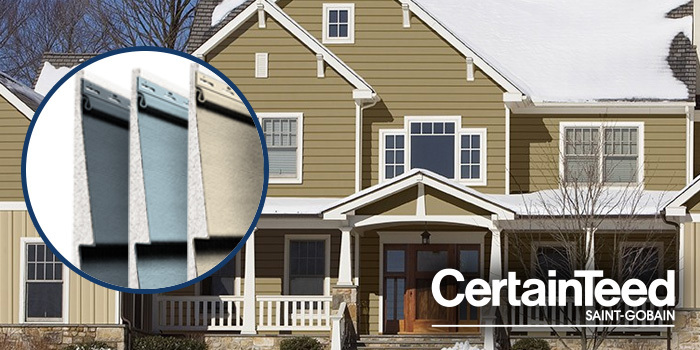 CertainTeed’s Hybrid Insulated Monogram Siding and CedarBoards Insulated Siding are both available at Wholesale Siding Depot in a wide assortment of colors, sizes and styles to complement any architectural model. In fact, we’re currently featuring new low pricing on the D6 and S7 CedarBoards, and our Hybrid Insulated Monogram Siding starts at $127.95 per square.